Since she was a little girl, Mary L. Hastler has loved books and reading. “It wasn’t so much the pictures in the picture books,” she said. “It was the words.” Pollyanna, read to her by her mother, was a favorite. She also used to create a pretend library for her stuffed animals and her sisters’ Barbies. Life didn’t initially lead Hastler to libraries. She was in health care administration at Johns Hopkins and later worked for Baltimore County in mental health. After moving to Harford County, a neighbor suggested coming to a Friends of the Library meeting, where she became heavily involved and took a nine-hour part-time position that fit in her schedule. Hastler loved working at the library and decided to leave health care. Working her way up to become Harford County Public Library’s CEO in 2010, she oversees about 375 employees with an operating budget around $20 million. 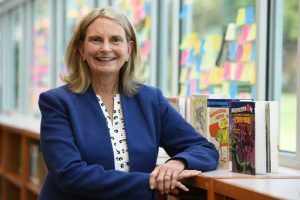 Hastler and her staff have created a number of innovative initiatives at the library branches over the years, including being the first library in the state and in country to offer free 3-D printing, their digital media Innovation Lab and pre- and early-literacy STEM kits. Besides books and DVDs, the library system also offers a number of unique items to check out, including American Girl dolls, balance bikes, fishing rods, musical instruments and Wi-Fi hot spots. Hastler is active in a number of organizations including serving as chair of the Harford County Commission for Women, gubernatorial appointee to the Maryland Humanities board and a member at large for the Harford County Chamber of Commerce. She is passionate about giving back to the Harford community because she gets so much back in return. What is the one decision you made in life that had the biggest impact on your career? I completely changed careers and as a result changed my life in ways that I did not expect. It has been an unforgettable journey!